Every day, Ohioans assess risks and decide about their lives. We engage in many behaviors for a wide range of reasons. We know and accept the risks inherent in sports or smoking or even driving a car. Usually, however, we do not regard simply going to work as an especially dangerous task. For some Ohio workers, though, heading to a job poses clear and real risks. In 2015, the federal Bureau of Labor Statistics reported that over 4,800 American workers were killed as a result of work injuries, and over 200 of those employees were in Ohio. Additionally, according to state and national data, there were more than 125,000 nonfatal injuries to Ohio workers that same year. Though injuries and deaths occur across all areas of employment, some fields are especially dangerous. Here, we examine the factors that increase the dangers and discuss specific jobs that may put Ohio workers at increased risk. Physical labor – Jobs that involve strenuous activity wear down the body and can often lead to injury. Frequency of travel – Transportation accidents are the leading cause of work-related deaths in Ohio. Simply, those who travel more are more at risk for being involved in a potentially devastating accident. Location of the job site or travel – When employees travel to locations distant from medical care, the dangers rise. Too often, employees have suffered further injury because their access to a hospital was delayed. Cleanliness/organization of office or job site – After transportation accidents, slips, trips, and falls account for the highest number of job-related injuries. Wet floors, uneven surfaces, improper protection, and more can contribute to the high rate of injury. Transportation/Material Moving– Spending long hours on the road and dealing with moving heavy cargo makes careers in transportation riskier for workers. UPS, FedEx, and Amazon, and several other trucking and shipping companies, employ large numbers of Ohio workers moving goods from warehousing to businesses and private homes. Agriculture and Natural Resources – Agricultural, forestry, fishing, and hunting work was related to the highest percentage of job-related injuries in 2015. Ohio is covered by over 8 million acres of forest and about 14 million acres of operated farmland, creating a large share of employees at risk for injury through machinery, elements, and transportation. Healthcare – Workers in the healthcare industry suffered injuries 3.7 per 100 workers, which ranks them among the top in the state. With many large medical centers including those at the Ohio State University, Nationwide Children’s Hospital, and Mt. Carmel Health Systems, healthcare workers make up a meaningful portion of the state workforce and are exposed to risks through physical labor, disease, travel, and more. 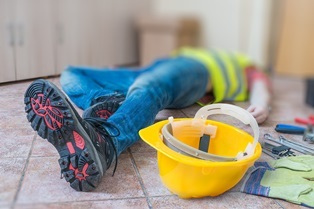 Construction – besides the dangers posed by travel and movement around job sites, construction workers also experience more frequent injury and death due to slips, trips, and falls. The busy nature of a job site and the physical work create specific risks. Management – Upper-level employment often entails significant travel to meetings and conferences. With frequent travel comes the risk of vehicle accidents, and transportation injuries were high among managers when viewed among other jobs. Even in office settings, there are employment risks, and Ohio is home to several large corporate headquarters or main offices, including Nationwide Insurance, JP Morgan Chase, Limited Brands, and others. Production and Maintenance – In Ohio, manufacturing and maintenance jobs abound. In manufacturing and assembly plants like those at Honda and Whirlpool, work tasks can include lifting and transferring heavy objects, inspecting moving parts, cleaning equipment and goods, and other potentially risky duties. Despite the dedication of both employers and employees, work injury and illnesses do frequently occur in Ohio. If you have suffered an injury at work or a family member has died due to an injury or illness sustained at work, you may be eligible for Ohio workers’ compensation benefits. At Monast Law Office, attorney Jim Monast and his legal team protect the rights of employees and their families, and they work to ensure workers can obtain the medical care and compensation they deserve. Call our Upper Arlington office today, or take a moment to fill out the contact form on this page to find out how we may help.